Marko Syrjala Finland’s Imperiumi spoke with KISS frontman, and bassist, Gene Simmons. Highlights of the interview appear below. Imperiumi: How did you pick up the guys [in your solo] the band? Gene Simmons: Well, they played on the KISS Kruise. And they do a tribute; they have a big rock show or something. You know, it just happens. I didn’t pick them; we had a different drummer. We had two different drummers before, and they just said, “Hey, you’ve got a show coming up. Our drummer can’t make it; he’s got to go.” So, I said, “Well, get another drummer. Don’t think about it.” If you plan something too much, sometimes it doesn’t work. This band just came together without any planning. We get along great. Nobody uses drugs, no drinking. Imperiumi: Do you ever have days when you’re doing absolutely nothing? Gene Simmons: Well, even when I have a day off, you have all these businesses, emails all the time, and lawyers, and everything. I’m even starting a company for vegetables. In about a month in grocery stores and it’ll come around the world. But it’s a new kind of vegetables. You take grapes and tomatoes, and you mix them up. And that’s big. It’s a big, big thing. I own this logo; I designed it. Imperiumi: One thing what the KISS fans have been waiting for a long time is the next episode of Kissology. Is that ever going to be released or is something you’ve decided not to do anymore? Gene Simmons: Well, number four is finished, but the lawyers are taking their time, I don’t know why. It takes a long time. Imperiumi: I remember that I read your interview from the year 1985 where you said that there’s nothing more embarrassing than some guys on stage at their 50’s. I think that you pointed to Rolling Stones at the time, but things have changed. Gene Simmons: When I was a kid, we used to say, “Don’t trust anybody over 30.” When Paul McCartney wrote a song, he said, “Will you still love me when I’m 64?” Well, he’s 74. This rock and roll thing doesn’t have rules because it never existed before. It’s a new thing. Rap is a new thing. Classical music has been here forever. Even blues has been around for a long time. Before the ’50s, there was no such thing as rock and roll, and what are the rules? The people who are writing the songs and playing them could not even read or write music. I can. I can write songs and play a few instruments and do that, but if you showed me a classical music sheet, I can’t read it but those guys that read the classic, they can’t write Dr. Love. Imperiumi: How long you think you can carry on doing this? Gene Simmons: Well, in KISS, we can’t continue longer than the early 70s. It’s because the band is the hardest-working band in show business. You see Iggy on stage. He doesn’t have to carry any weight, except it’s a hard show, but wear sneakers and jeans. Me? [laughter] It takes a long time, and the outfit weighs a lot, and the heels are taller even then your girlfriend’s. It’s a lot of hard work, and when we come off the stage, for me, you’re really tired. So, in its present form, KISS can’t do it 75, 74. I wouldn’t want to do it one day longer than it was real. Imperiumi: The next KISS tour is going to start in February, is it really going to be the final tour? Gene Simmons: I don’t know. Imperiumi: Do you have any plans to invite some special guests from the past maybe? Gene Simmons: We talked about it. But we haven’t decided anything. The problem is if you bring out a special guest, they come on without makeup. They do. We haven’t really gotten that far. Imperiumi: I’m asking this only because some former members of the band have said in public that they would love to be a part of this tour, in a way or another. Gene Simmons: Who is? [laughter] I do know, but it’s not going to… yeah. You can’t put on the makeup. You’ve been out of the band 20 years. It’s not going to happen. And it’s a difficult question because if we did bring out anybody that was in the band, they can’t put on the makeup. Imperiumi: But you have been talking about it? Gene Simmons: Not a lot. No. Imperiumi: The very last question; when the time of the very last KISS show comes, would you like to have all living members of KISS joining the event? 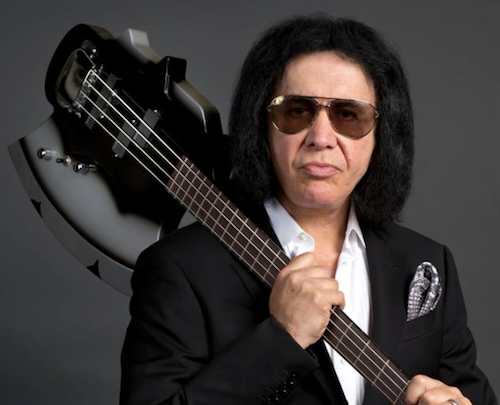 Gene Simmons: It sounds like it should be, but I don’t know yet. We’ll see. Read the entire interview, at Imperiumi. It’s sad to see your music heroes fall, but it’s kind of hard to be sad watching Paul Stanley these days. Sure, he was one of the best frontmen ever at one time, but he takes every chance he gets to insult former members and their ‘inability’ to perform, and then goes out a croaks his vocals at their shows. Peter was never great once he came back and Ace has had his problems as well, but neither were ever as bad as Paul is these days. It’s almost cringeworthy and painful watching him try to ‘sing’. He was always one to rip on bands for staying around too long, and now he’s the epitome of what he’s constantly insulted. Gene used to be the one to run his mouth in a bad way, and still does sometimes, but Paul has completely taken the reigns and run with that now. If he didn’t turn into such an insecure and egomaniacal jerk, I’d maybe feel bad for him. I’ll take Simmons, Frehley, and Singer. Put them in Dressed To Kill era suits and call it Rocket Ride, or Rock Bottom etc. Unmask them and let them just play. Give me a real treat and put Kulick up there with them. Paul is beyond done. He can’t croak a note without it sounding laboured. I’ll take my kids to see them because my youngest hasn’t seen them yet. But I’d be cringing the whole time. Of course you can express your opinion. YOUR opinion. I would never in a million years seek to stop you expressing your opinion. What I’m asking is that you stop with the “most real KISS fans”. It’s insulting, and it’s wrong. There were just shy of 20,000 people in Hartford that thought differently than you. If you have an opinion, own it, don’t play the “most real KISS fans!” card as if you speak for all of us. I’ve met all of them as well (except, ironically, Peter). Both Erics? Charming gentlemen. Wonderful people. Gene? Amazing. Paul? Again, a gentleman. He spoke to my then seven-year-old daughter like she was the most important person in the world, an experience she still treasures. Bruce? Tommy? Both fantastic. Nice, humble guys. Worst experience? Unfortunately, Ace (though Vinnie wasn’t far off). He was hammered, disrespectful, and ended up falling over, and my brother (security at the time at the club he was playing) carried him out to the custody of his road manager. I get it, people make mistakes, and everyone is allowed to have a second chance. By all accounts, Ace is happy and sober and delivering the goods musically. But honestly, given that Paul’s voice is going to be what it is no matter who plays guitar, I’d rather know that the band wants to be there, wants to play hard, and wants to put on a show. If you want to see something different, that’s fine, cool, maybe it can happen for both of us (there is a rumor going around of “guest spots” on the new, possibly final, tour and though Gene denied it, he did so half-assed). Ace and Peter will always be part of the Kiss family, no doubt, but I don’t feel any less a “real Kiss fan” for wanting to preserve my memories than have them tarnished by a lackluster performance from a guy that feels he’s underpaid and has to paint a “teardrop” on his face as a “message to his fans”. Please. Okay, once and for all, here’s my definition of a “real KISS fan.” First of all, I have absolutely nothing against Singer & Thayer personally, they’re good people and good musicians, but here’s the problem, they are not the REAL Catman & Spaceman! Doesn’t matter how (drunk, high, tricked, or even sober) and or why Ace & Peter gave up the “rights” to THEIR makeup and costumes, it is, was, and always will be WRONG to parade Eric & Tommy around as the Catman & Spaceman. If they were given their own identity, we wouldn’t even be having this conversation right now! Of course even this version of KISS on a good night can still draw 20,000 people, but I guarantee you, most of them are only there for the show and probably have no clue about the real KISSTORY! And IMO if you’re ok with that, then you’re really not a REAL KISS fan, it’s that simple! A real KISS fan wouldn’t be ok with this charade, just ask Eddie! Totally agree, Bill. Both Tommy and Eric have been in KISS longer than Ace or Peter were in the band. Were they original members? Absolutely not! Ace and Peter will always be the original Spaceman and Catman. But Tommy and Eric have earned their stripes as full fledged members of KISS. Personally, I wish KISS had dropped the whole makeup thing years ago. If they had, a lot of the complaints of the “true KISS fans” would have been dropped. I personally enjoyed the “no makeup” years, because they were able to focus on the music. They still put on excellent shows without the makeup during those years. They don’t need the makeup! But Gene and Paul decided to go back to the makeup for the original reunion tour, and have been doing it ever since. Ace and Peter sold them the rights to the characters, so they can let anyone they want wear it. And guess what? People are still paying to see the shows with Eric and Tommy in the makeup. Gene and Paul did not force Ace or Peter to sell the rights to these characters to them, so why is there so much hostility about it? I just don’t get it! Again, Doug, I agree with you. Just cuz Ace and Peter sold their legal rights to their characters to Gene and Paul, doesn’t make it morally right for them to parade imposters as Spaceman and Catman and still sell it as KI$$. Today’s KI$$ is nothing but a glorified tribute band. It makes no difference if both Eric and Tommy have been in the band longer than originals Peter and Ace. That’s not the point cuz longevity has NOTHING to do with the issue. If Eric and Tommy had created their own characters, I’d be fine with it. But the original characters were originally created as the personas of each of the original members. If people are okay with imposters, then go see a KI$$ tribute band, at least then you will get a Starchild who can sing, a Catman who can play drums, a more energetic band, and at a much more affordable ticket price. KI$$ tribute bands are great, but they are not the real KI$$, just like the current tribute version of KI$$ isn’t the real KI$$. I love ya, but I just can’t agree with you on this. First off, it DOES matter that Ace and Peter sold the rights to their characters to Gene and Paul. They were both adults, and they knew that selling those rights meant that Gene and Paul owned them, allowing them to do whatever they wanted with those characters. Obviously, the characters meant less to them than the money they received. So, these characters were not some “sacred cow” to them. They were property that they owned, and decided to sell for a price. KISS fans are not children, they understand that Eric and Tommy are not the original Spaceman and Catman. They are playing characters in a show, just like when you go and see a play that doesn’t have the original actors that were in the play when it originally hit Broadway. Ace and Peter have not been in KISS for many years, and everyone knows it. Gene and Paul are not lying to anyone about this. You are suggesting that KISS is somehow cheating their fans by having Tommy and Eric wear these costumes, and that’s just not the case. Again, I would prefer KISS get rid of the makeup/ characters. It was different back in the 70’s when you never seen their faces without the makeup, and their was this mystery about them. But after they ditched the makeup when LICK IT UP was released, that mystery was gone. I enjoyed their music and shows just as much without the makeup as I did with it. I was actually disappointed when they put the makeup back on. Without that mystery from the 70’s, it just seemed ridiculous to me. But this wasn’t my decision, and the fact that they have been able to keep the band going for all these years with the makeup on proves that Gene and Paul were right. As I stated, Tommy and Eric have been members of KISS longer than either Peter or Ace were in the band. They are good players, and deserve to wear these costumes. They aren’t trying to fool anyone into thinking they are Ace or Peter. If someone decides they don’t want to see them because they aren’t the original members of KISS, that’s up to you. But stop suggesting that Gene and Paul are trying to perpetuate some kind of fraud on all of us who have purchased the music and concert tickets of this version of the band. Because it’s not true, and it suggests that we are not smart enough to know this difference. Keith, I never stated or suggested Gene and Paul are perpetuating a fraud. They have both been open about who the imposter behind the make up is. Gene and Paul have been making the right business decisions, including buying character rights, to continue the longevity of the band…good for them. They attract new audiences that span generations. Again, good for them. Gene and Paul may have the legal rights to those characters, but that doesn’t make it morally right, IMO. And i don’t think longetivity in the band earns Tommy or Eric the right to wear the costumes. If longevity earned stripes, then Arnel would have been inducted into the RRHOF with Journey. Tommy and Eric, or any other imposter, are simply performing parts in a performance that were created by others. Somebody on this website once stated about this KI$$ issue “Replacing band members is one thing, replacing legends is something else!” That’s exactly how I feel about this issue. Rattle, that was me, bro! I said that like 3 years ago. The point that Keith and some others aren’t getting is that just because Paul & Gene have the right, DON’T MAKE IT RIGHT! Again, if Eric & Tommy were given or created their own identities/characters, this wouldn’t be an issue at all! Doug, I thought that was your quote but I wasn’t sure! No truer words have been stated about this issue. I love the original KI$$. There was never a band that held my passion the way the original KI$$ did. This is such a polarizing topic for us fans, and I enjoy reading everyone’s opinions. None of us are right or wrong. We are all just sharing our passion about these bands we all enjoy. It’s all good fun and makes for great debate. And 1 more point, would anyone want to see someone else other than Vincent Furnier being Alice Cooper? I can’t imagine anybody being OK with that! I think this goes back to my preference that KISS drop the makeup all together. If they were doing shows without the makeup, this would not be an issue. I guess I’m just not as hung up on the Spaceman and Catman characters as others are, even though I’ve been a serious KISS fan since 1977. Once they dropped the makeup with the LICK IT UP album, my fascination with the characters they played was over. Ace and Peter both sold the characters to Gene and Paul. So, I guess I don’t get why these characters are so sacred to some folks when they were obviously not sacred to the guys that created them. But, to each his own! I just don’t like it when some people call Eric and Tommy “imposters”. That’s like calling someone playing a role of a historical figure an “imposter”. God and everybody else knows that that actor is not the character they are playing. But nobody calls them an “imposter”! Both Eric and Tommy are good players (Eric is actually an EXCELLENT drummer), and deserve much more respect than they receive from some people on this site. I’ve got to say that, while I respect the comments Doug and Rattlehead made concerning wanting the original four members back for the final tour, I don’t agree with them. First off, Peter and Ace VOLUNTARILY sold their rights to these characters back to Gene and Paul. So, regardless of who came up with the characters originally, the characters aren’t theirs anymore. Gene and Paul can do whatever they want with those characters, including letting Tommy and Eric use them. Secondly, Peter is not physically capable of playing with the band on any kind of extended basis. From what I’ve read, he was barely able to do the job on the original reunion tour. This isn’t Peter’s fault, but reality is reality! If Peter could come back for the final show and play a song or two, I fine with that. But, Eric Singer has been a member of KISS longer than Peter was, so he deserves to sit behind that kit! As I’ve stated before, I have been a KISS fan since 1977 when ROCK AND ROLL OVER was released. I’ve loved this band for 41 years! Peter and Ace will always be special to me, because they were the original members. For the final shows, I would love to see all of the remaining living members come up on stage to play. Personally, I think KISS should play these shows without the makeup, and let the music do the talking. But, ultimately, it’s up to Gene and Paul. They should do whatever makes them happy, because they are the ones that have kept the KISS train going for over 40 years! Whatever they decide is fine with me.